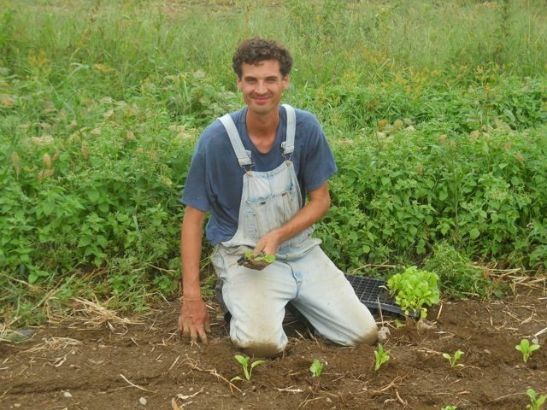 I was very excited about visiting this restaurant as we just love the area. The Hudson House Inn is located in the charming town of Cold Spring, a lovely historical town with well preserved 19th century buildings. Cold Spring is just a stones throw from Garrison NY, home to Boscobel Restoration where the Hudson Valley Shakespeare Festival is held every summer. 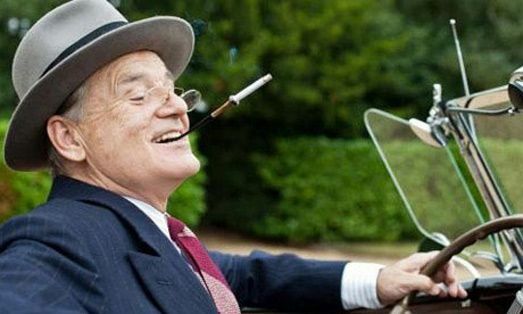 My husband Larry and I make it up to the Shakespeare Festival at least once, and maybe twice a year, to see a performance. The drive up the Route 9 along the Hudson River is just gorgeous. An interesting note on the Hudson House Inn: it’s a landmark building dating back to 1832. Above the restaurant you will find 11 rooms, many with breathtaking views of the Hudson. The HVRW menu featured many options from the main menu, so we decided to go with both. Since it was just the two of us, we opted to forgo a whole bottle of wine and started with a glass of Prosecco, and later choose a glass of wine with dinner. 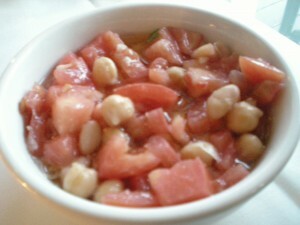 Immediately, we were brought a yummy amuse-bouche made with cannellini and ceci beans, tomatoes and fresh rosemary. It was fresh and tangy, served with crunchy toasted bread. For our first course, we both started with soup. 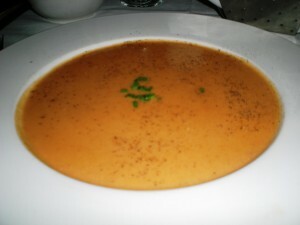 Mine was the Lobster Bisque, noted in their menu as an all time favorite. No surprise! It was luscious and velvety with chunks of lobster. 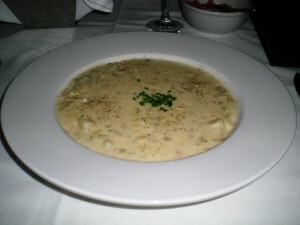 Larry got the New England clam chowder, a special for the evening. Purists will claim that clam chowder should be thin. I think it’s really a matter of taste. We both like it on the thicker side, which is how it was presented here. This one was divine with nice chunks of clams and potatoes – hearty and filling. Just before our main course arrived we chose a glass of wine, delivered in quartino carafes. I had a 2008 California Estrella Pinot Grigio and Larry got a 2007 Italian Chianti from Gabbiano. Both were perfect for our dinners. 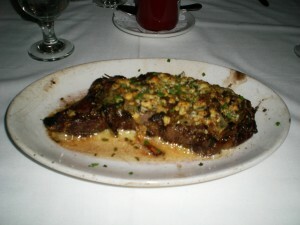 Larry’s main course was a rib-eye steak topped with caramelized onion and maytag blue cheese. The plate was sizzling as it was set on the table, and the aroma was out of this world! The meat was cooked perfectly medium rare. At my request he got a side of shoestring potatoes that were perfectly crispy. 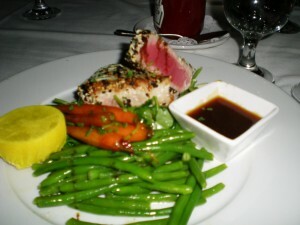 My main course was the sashimi tuna, which can also be found on the regular menu. It was seared with a crunchy white and black sesame seed-wasabi crust. 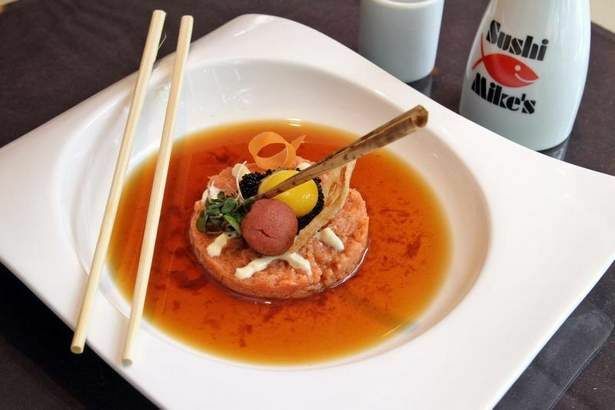 It had great flavor, and the soy dipping sauce kicked it up a notch. The vegetables on the plate were also perfectly cooked and full of great flavor. The natural sweetness of the haricot verts and baby carrots were there, with a nice bite. We loved the atmosphere. The restaurant was busy, but the room didn’t seem cramped. We had a nice table for two by the window that looked out on to the Hudson Highlands where Mount Taurus and Break Neck Ridge rise dramatically out of the banks of the river. The portions were large, so we opted to just share my dessert, a homemade apple strudel. 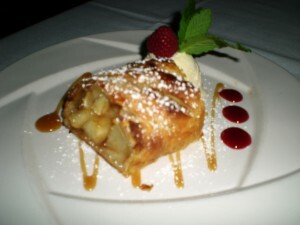 The apples were tender with a hint of cinnamon, wrapped in delectable crispy fillo dough. Along with the strudel there was a French vanilla ice cream with a scrumptious raspberry reduction and caramel sauce. A perfect end to the meal. On our way out we peaked in the Tavern Room, which was jam packed. They featured live jazz in that room all winter along with casual pub fare. Had there been a few seats open we would have sat there for a bit. The performer of the evening was accompanied by a great sounding guitarist. In addition to lunch and dinner, the Hudson House Inn also offers a nice brunch menu. (http://www.hudsonhouseinn.com/dininghome.htm) Our hostess also told us that during the Shakespeare season, they offer a prix-fixe menu. We will definitely be back! The 411 on Hudson House River Inn. The Hudson House is located in the Village of Cold Spring not the town. It is the Town of Philipstown.